Welcome to Portlethen Tennis Club! Portlethen Tennis Club is an informal, friendly club. Anyone is welcome to join - beginner or experienced player; junior or adult. We play on the two tennis courts adjacent to the Bourtree Pavilion, close to the Green shopping centre at the south end of Portlethen. Activities include tennis coaching, for both juniors and seniors, monthly social tournaments, league matches, club championships and open sessions where members can just turn up and play. The courts have floodlights, enabling us to play into the evenings, and an all weather surface, suited to our damp and unpredictable climate. If you join the club you will receive a key to the courts and a personal membership card with details of the club playing times and activities. For full details of what's on offer see the court timetable. Here's a summary. Club sessions are the times when you can expect to find other members on court to play with. 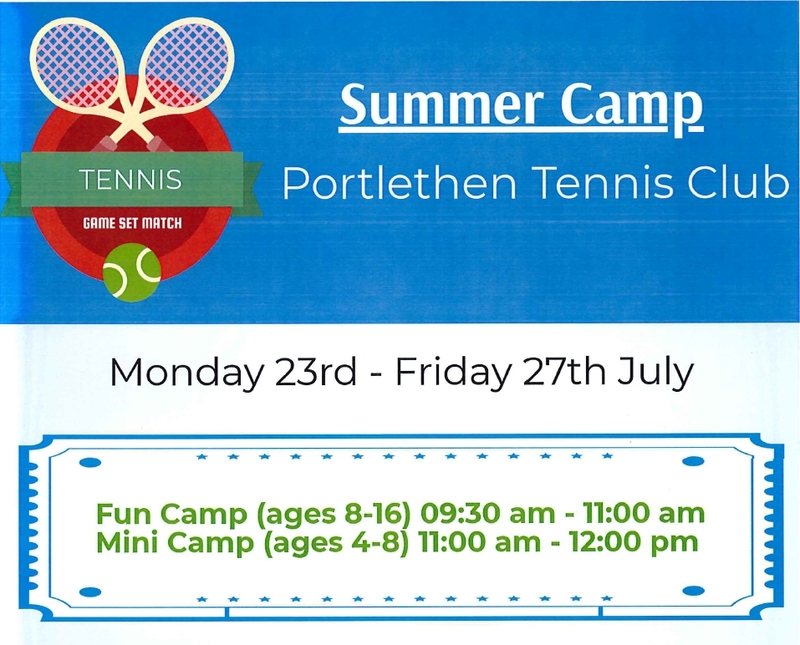 Open sessions indicate times when the courts are reserved for Portlethen Tennis Club members. You should arrange your own playing partner(s) at these times. On the first Sunday morning of each month, we hold an American Tournament. These are friendly events, open to all senior and student members, whatever their standard of play. To even things up, partnerships are picked out of a hat and halfway through each match couples swap partners so that each person plays half the games with their partner and the other half against him or her. It's great fun and a good opportunity to meet other members and have some entertaining games of tennis. The courts are reserved for junior members, 4-6 pm, Mon - Fri. Outwith the coaching classes, junior members can simply turn up and play at these times.No booking is necessary but, when the courts are busy, they are expected to play fair and ensure no-one is left sitting on the sidelines for long. Details of our current coaching classes are given below. Space permitting, the classes are open to non-members as well as members so, if you are a junior interested in learning to play tennis or an adult thinking of taking it up again after a break, why not come along to the coaching classes to start with and join later, once you've found out what fun it is? All sessions will be lead by LTA qualified coach, Daniel Colvin. Additional classes may be offered on a Thursday evening, depending on demand and coach availability. To enquire about this, please contact Daniel (see above for contact details). Fee reduced to £40 (Mini Red) or £50 (Orange/Green/Yellow) for a second child from the same family, provided both children are members of the club either as individuals or as part of a Family membership. Fee reduced to £50 for a second adult from the same Family membership. Note: Fees should be paid directly to the club coach, not to Portlethen Tennis Club. Cheques should be made payable to DNC Sports Coaching. Once you have reserved a place, please print off this registration form and take it with you to the first class. The Fun and Mini Camps will involve coaching, match play and team games and are open to players of all standards. All camps will be led by LTA qualifiedcoaches Darren Nicol and Daniel Colvin. Fees: should be paid directly to the club coach, not to Portlethen Tennis Club. Cheques should be made payable to DNC Sports Coaching. * Fee reduced to £26 (Fun Camp) or £22 (Mini Camp) for a second child from the same family, provided both children are members of the club either as individuals or as part of a Family membership. Once you have reserved a place, please print off this registration form and take it with you on the first day. First Week Free – So Come and Give It a Go! All sessions will be lead by LTA qualified coaches Darren Nicol, and Daniel Colvin. Note: Fees should be paid directly to the club coach, not to Portlethen Tennis Club. Cheques should be made payable to DF Sports Coaching. The following is a list of classes that were run last year. Similar classes are likley to be scheduled in 2019. All sessions will be lead by LTA qualified coaches Darren Nicol, Daniel Colvin and Stuart Adams. Note added 16/9/18: Daniel’s Phone has been unavailable for the last 3 weeks so please send another message/phone call to him if you have tried but received no answer. The Fun and Mini Camps will involve coaching, match play and team games and are open to players of all standards. All camps will be led by LTA qualified coaches Darren Nicol and Daniel Colvin. * Fee reduced to £30 (Fun Camp) or £22 (Mini Camp) for a second child from the same family, provided both children are members of the club either as individuals or as part of a Family membership. To members of the public there is a charge for playing on the courts but Portlethen Tennis Club members can play free of charge - you will be asked for your name and membership number when making a booking. For those who enjoy competitive play, we have a ladies and a gents team in the Aberdeen and District Leagues. Matches are played on Tuesday and Wednesday evenings and match practice sessions on Monday evenings for the ladies and Sunday mornings for the gents. Throughout the summer we run a knockout tournament, culminating in the Club Finals Weekend at the beginning of September. While the singles can be quite serious, the doubles are more light-hearted - partnerships are chosen by a random draw, pairing weaker players with stronger ones. Entry details are on the membership form. Further details . . .
On the first Sunday morning of each month, we hold an American Tournament. These are friendly events, open to all senior and student members, whatever their standard of play. The scores in these tournaments also go towards the Alan Tait Trophy which is awarded at the end of the season to the player with the highest total score. Further details . . .
Fees can be paid either by cheque or online bank transfer; the application form will provide further details. Once we have received both form and payment, you will be sent your membership card and court key. Fees for the 2019/2000 season are: £25 for senior members, £20 for senior citizens, £15 for students, £10 for juniors (age 16 and under) and £45 for a family membership. Portlethen Tennis Club encourages members to join British Tennis and become part of the national tennis community.